Jerry J. Vrba, 82, of Schuyler, died Saturday, February 4, 2017, at Bryan LGH West in Lincoln. Jerry J. Vrba was born February 27th, 1934 to Jerry and Ludmilla (Sedlacek) Vrba in Schuyler, NE. He attended District #34 from K-8th grade. Jerry farmed with his parents for several years before joining the Marines in 1956. He was stationed in San Diego, California before being transferred to Okinawa, Jerry was honorably discharged in 1959. He met his wife, Carolyn Kay (Houfek) in Fremont, NE and were married June 23, 1962. Of this union six children were born, Catherine, Nancy, Laurie, Christopher, Angela and Diane. Jerry farmed southwest of Clarkson on the family farm. Jerry was a livestock and grain farmer. He served as a school board member of school District #5-R, and was also a member of the Wilson Cemetery Board for several years. While farming Jerry worked as a security guard at New World Inn in Columbus. He also was employed at the Elks Country Club and the City of Columbus. In 1990 Jerry and Carolyn moved off the farm to a residence in Schuyler, NE, where he continued to work for the City of Columbus. Once retiring from the City of Columbus, he worked for Dublin Nursery in Schuyler until his retirement. Jerry loved the outdoors and being outside. He enjoyed spending time with family. He and Carolyn drove many miles attending their children and grandchildren’s activities and sporting events. After retiring he enjoyed reading the paper and putting puzzles together. Jerry was a man of faith. He attended Wilson Catholic Church in rural Colfax County. 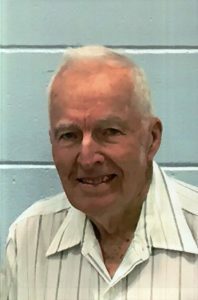 He was also a member of St. Cyril & Methodius Catholic Church of Clarkson and St. Mary’s of Schuyler. He was a member of the Catholic Workman. Jerry served as an usher and led the rosary for many years. Jerry is survived by his wife, Carolyn; daughters. Cathy (Rich) Kuhr of Mead, Nancy (Don) Coufal of Howells, Laurie (Ken) Bos, Angie (Mark) Gall all of Clarkson, Diane Vrba of David City; son, Chris (Tracy) Vrba of Lincoln; 18 grandchildren; and 8 great-grandchildren. Jerry was preceded in death by his parents, Jerry and Ludmilla Vrba; an infant brother and sister; and infant granddaughter Katelyn Gall.